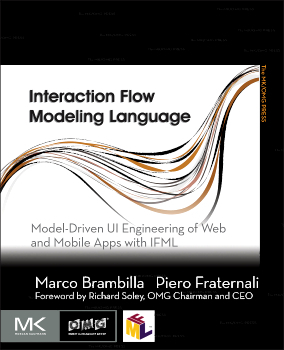 The book “Interaction Flow Modeling Language – Model-Driven UI Engineering of Web and Mobile Apps with IFML” introduces the reader to the novel OMG standard Interaction Flow Modeling Language (IFML). Authors Marco Brambilla and Piero Fraternali are also authors of the IFML standard and wrote this book to explain the main concepts of the language. They effectively illustrate how IFML can be applied in practice to the specification and implementation of complex web and mobile applications, featuring rich interfaces, both browser based and native, client side components and widgets, and connections to data sources, business logic and services. The book provides you with unique insight into the benefits of engineering web and mobile applications with an agile model driven approach. Concepts are explained through intuitive examples, drawn from real-world applications. The authors accompany you in the voyage from visual specifications of requirements to design and code production. The book distills more than twenty years of practice and provides a mix of methodological principles and concrete and immediately applicable techniques. Dr. Richard M. Soley, chairman of the OMG, wrote the foreword of the book. The intended readership spans from IT professionals to business-oriented people, and also to researchers and graduate students of Computer Science / Computer Engineering disciplines.